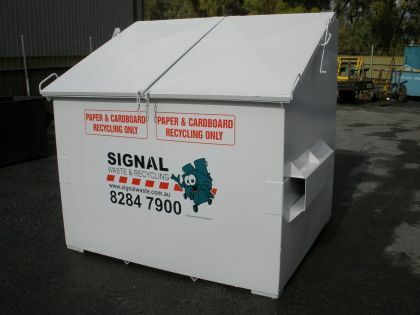 For South Australia's best prices on waste and recycling call Signal now on 8162 5544. We specialise in waste removal and recycling services throughout Adelaide, South Australia. 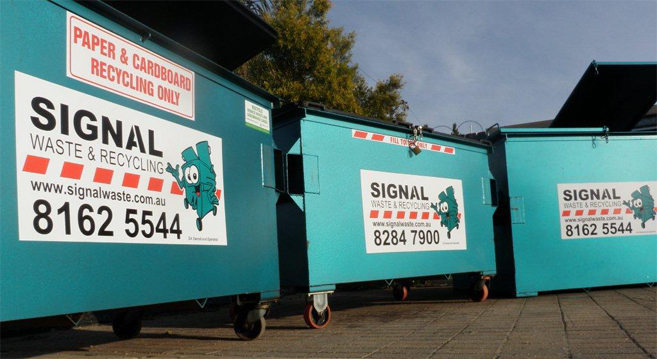 Signal has been providing a complete range of rubbish bins and recycling bins to the commercial market for over 23 years. Do you have a need for an ongoing waste management and recycling solution? Signal can schedule a tailor made waste removal and recycling program that best suits your industry and business. Signal Waste encourages waste minimisation and supports South Australian's strategic plan of reducing waste to landfill by 25% within 10 years. Rubbish collection and recycling bins. The front lift compaction bin is the most economical and convenient system to date for ongoing rubbish removal and recycling, from low user to weekly or daily waste removal needs. These bins remain on your site and provide a neat and compact solution to store waste and recyclables between collections. Suitable for the collection and disposal of most types of light industrial and commercial waste and recyclables. These bins come in three sizes. 1.5 cubic metre front lift bin. 3 cubic metre front lift bin. 4.5 cubic metre front lift bin. They all have options to include lockable spring loaded steel or plastic lids and castors for easy movement. One stop shop for all of your waste and recycling and rubbish removal requirements. South Australian owned and operated. We are Adelaide's local waste remover buying local and hiring local. We have been established since 1989 with over 75 years of combined experience in the removal of rubbish and recyclables. Our services are uniquely tailored to your business providing exceptional value for money. One invoice, one contract for all of your waste disposal and recycle requirements. Availability on reporting of greenhouse gas emissions. Speak directly with friendly local South Australian staff, accounts people and stakeholders. Exceptional service backed by our Signal Guarantee. Member of organisations that help Signal keep at the forefront of world's best practice for disposal of wastes and recyclables.